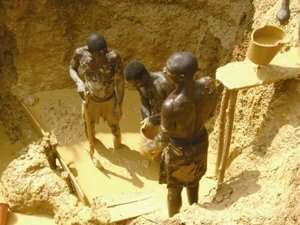 Thirteen 'galamseyers' (illegal mining operators) including; three women are in the grip of the Brong-Ahafo Regional Operational Unit of the Ghana Police Service for engaging in galamsey activity at Ntotoroso in the Asutifi North District. Briefing the Ghana News Agency in Sunyani, Chief Inspector Augustine Kingsley Oppong, the Regional Police Public Relations Officer said the Police while on an operational duty at Ntotoroso and Kenyasi to clamp down on galamsey operators spotted a place at Ntotoroso which had been fenced with iron sheet like a construction site. He said the Police personnel drew closer to the place but the illegal miners on seeing them fled, adding that they were chased and 13 of them arrested and brought with items seized to the Regional Police Headquarters in Sunyani. The items included; three motor bikes, one grinding machine, one spraying machine, a bicycle and 50 bags of sandy-soil suspected to be bearing gold. Chief Inspector Oppong mentioned their names and ages as Kwadwo Awinda, 54, farmer, Kwadwo Sam 32, unemployed, Iddrisu Gariba 48, farmer, Mohammed Kwame 65, unemployed, Akwasi Oppong, 24, businessman, Douglas Stephen, 17 unemployed, Paul Boateng, 20 unemployed, Nuhu Issac, 30 unemployed, Daavi Esi, 49, Mariama Ibrahim, 38 and Alamatu Braima, 46 . He said they would be arraigned before court after investigations to deter others from engaging in illegal mining operation. Chief Inspector Oppong said Police interrogation revealed that seven of them were from the Northern Region, Ashanti Region, four, Volta, one and Brong-Ahafo, one. He said 12 other illegal miners had been arrested earlier at the same site and their case was still pending before Court. Chief Inspector Oppong added that the site owners would be arrested to assist the Police to ascertain if the land was legally leased to the 'galamseyers' or they were forcibly operating on it.